Nottingham Forest boss Martin O'Neill. 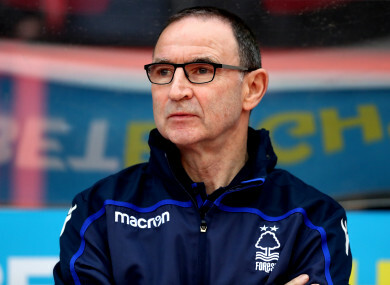 MARTIN O’NEILL EXPRESSED satisfaction after picking up his first win as Nottingham Forest manager, while emphasising the need to add to his squad before the January transfer window’s closure. The former Ireland boss saw his side beat Wigan 3-1 and move up to ninth in the Championship, four points off the play-off spots. Goals from Joe Lolley, Matty Cash and Adlene Guedioura were enough for the City Ground outfit to prevail, with Josh Windass’ first-half equaliser proving immaterial, while Irish striker Daryl Murphy started the game. “Great to win the game,” O’Neill told the BBC afterwards. “I thought that we did excellently with some great goals and excellent performances. “I’ve got to know the players a bit better in the past week and there were some things we worked on on the training ground that were well-executed today. “But, there’s also some areas where we can still improve on. The response from the players today was truly terrific. Bournemouth’s Tyrone Mings and Leicester’s Andy King have been linked with the club and O’Neill is keen to bring in some new recruits in the coming days. “I do hope to make signings in the near future but then, you could say that the near future is Thursday, couldn’t you?” he told reporters. “I think it is obvious to the crowd and to ourselves that we need to supplement the squad. “We have positions, which you can see — and you might know better than me — where we have to improve and bring players in, partly because of the long-term injury problems we have. “We do not want to be left behind. Those three points help us. But we want to have a massive drive in the back end of the season and we do not want to be short of players. Email “Martin O'Neill pleased after picking up first win in new role”. Feedback on “Martin O'Neill pleased after picking up first win in new role”.